Don't want to drive to Cape Cod? Two bus companies offer comfortable, inexpensive, hassle-free transportation to get you here, any time of year, from most major northeast cities including Boston, Providence, and New York City. Plymouth & Brockton (nicknamed "P&B"). Schedule: Both Peter Pan and P&B have daily departures, every two hours from early morning through early evening. Average travel time between Boston and Cape Cod is about an hour and a half. Fares: Peter Pan's round-trip tickets begin at $37 per adult. P&B fares start at $33 per adult, round trip. At the Peter Pan Bus Lines terminal, 1 Bonanza Way, Providence. Schedule: 6 departures a day, every two hours, from mid-morning to early evening. Total trip time from Providence is about 2 hours. Fares: From around $50 and up per adult, round trip. Schedule: Leaving New York City 6 times a day, from early morning through mid-afternoon, and arriving here about 6 hours later. During the summer months, more departure times are often added, depending on demand. Fares: Ticket prices begin at about $108 per adult, round trip. *Note - Peter Pan sometimes offers 10-15% discounts off their standard fares. But the discount is only valid if you buy your ticket online. Other Info: There's no reserved seating. Whether you buy your tickets at the terminal, purchase them on line, or order them over the phone ... boarding is "first come-first served". These super-discount carriers don't come all the way to Cape Cod. However, they do go to Boston - and from there you can transfer to a Peter Pan or a P&B bus to Cape Cod. Using two different carriers and connecting through Boston will cost you some extra time. But if you're really intent on getting the cheapest bus fares possible, then it's probably worth checking out this option. * Caveat: Some folks absolutely love riding these discount bus lines. Others would rather walk to their destination in bare feet, across miles of broken glass. I've never ridden on either MegaBus or Bolt, so I can't personally vouch for either one. If you're not familiar with the low-fare bus lines, please do plenty of research in advance to make sure it's the right choice right for you. Let's say you'd like to go to West Yarmouth or Dennis or some other town that's not a destination for one of the major bus companies. Can you get where you want to go by bus? Sure! Just take your preferred bus line to Hyannis. 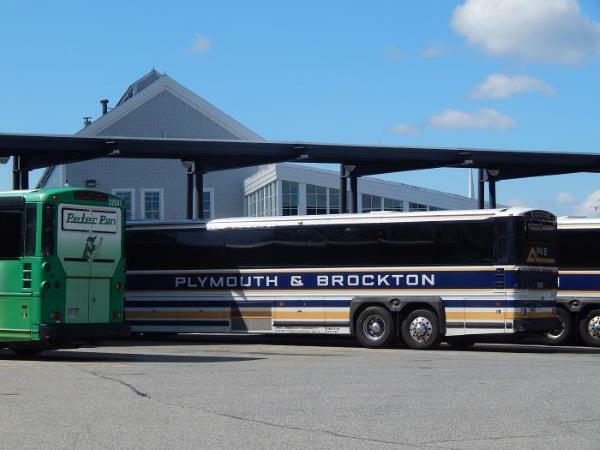 From the Hyannis Transportation Center you can connect to other towns via a local Cape Cod bus. Check out the Cape Cod Regional Transit Authority website for more info.